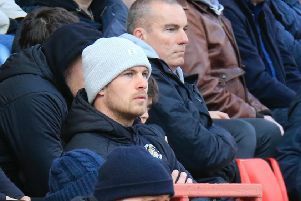 Hatters defender Dan Potts has vowed to cut out the bookings this season after he received his sixth caution of the campaign at Exeter City on Saturday. The full back had only just returned from a one game ban for five yellow cards, when he went into referee James Linington’s notebook in the 80th minute for kicing the ball away. It’s annoying in that respect, but it’s definitely something I’ll try and nip in the bud. He said: “I don’t really remember doing anything to be honest to deserve it, it was just one of those things. “When you’re winning games, yellow cards are going to get picked up, what’s more important, three points or a yellow card? “I don’t want to get too distracted by it, most of my yellow cards this year have come from fouls that have been off the ball sort of stuff and a dive against Colchester which wasn’t a dive. Potts had also been highly frustrated with the manner in which he received his fifth caution at Accrington, as home defender Mark Hughes threw himself to the floor in an attempt to win a red card from official Martin Coy. He continued: “I was gutted, really disappointed. It was nothing, obviously you can’t appeal yellow cards, if you could appeal a yellow card it would have been appealed. “He’s tricked the ref, but that’s happened now, it’s gone. “Hopefully that doesn’t happen anymore, it was my fifth yellow and it could have been a red I suppose as well, luckily it wasn’t. Prior to sitting out Saturday’s win over Stevenage, Potts hadn’t missed a single minute of League Two action this term, easily showing his best and most consistent form for the club since joining from West Ham United in the summer of 2015. He added; “I’m getting the run of games and personally I think I’m playing well. “I just want to keep going, keep playing, keep enjoying it. Games come thick and fast, and when you’re playing like this and the team’s playing like this, I can’t wait to go to Crawley now on Saturday.